A very popular rajasthani dish. u can fry with ghee. In a large bowl mix wheat flour, rawa, ajwain, saunf, baking soda, salt, little oil and ghee and knead it to a stiff dough by adding little water. In a cooker pour 3 cups of water and boil it. when the water starts boiling add these balls. Do not put the whistle. keep it for 20 minutes. The balls will start breaking and will be double in size. Switch off the gas. Drain the water. Cut it into half and deep fry the balls in Oil. Fry them till golden brown and drain the excess oil and soak them in the melted ghee. 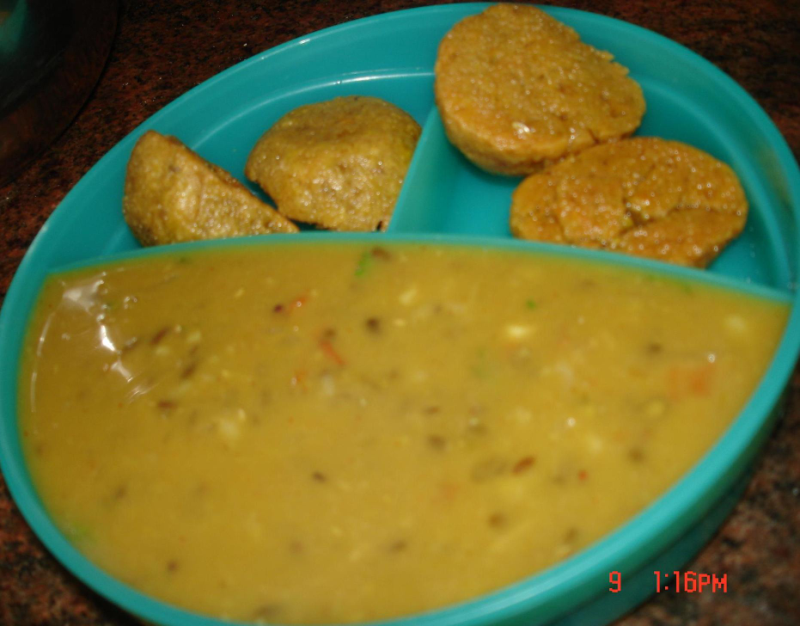 Wash urad dal, chana dal, moong dal. Pressure cook dals with turmeric powder and 2 ½ cups water.Keep till 5 whisltes. when the steam is subsided,open and dal will be cooked and looks like mashed paste. stir it. crush clove,ginger and garlic in mortal and pestle. After mustard splutters, add cumin, hing, cinnamon,green chillis, crushed clove, ginger,garlic, sauté for a minute. Then add chopped onion and sauté till pink, add coriander powder, red chilli powder and then put tomatoes. Fry them till oil comes out .Add the cooked dals and stir well.Add 2 cups water and salt. cook for another 5 minutes. garnish with coriander leaves. Switch off the gas. Dal is ready. Dip bhati in the dal and eat or crush bhati and pour dal over it and add ghee. Seems a wonderful recipe to me.will try it soon.TC. u can bake in oven or can roast in tandoor but i feel this fried one tastes good.crispy outside and soft inside. can you do the Bhati with out frying??????????????? One vote from me. with churma it goes well.good work.